149. Human Resources Management: Managing Social Media – How to Shape Human Behavior. 00:00:50 Five years ago, nobody would have considered social media as a part of Human Resources. The debate today is how companies can effectively use social media to help Human Resources best do its job. 00:02:50 There are actually companies out there who shouldn’t use social media because their company lacks the culture, legal conditions, and openness required to be successful on social media. 00:03:36 Web 1.0 sites are very simple websites where a publisher such as a newspaper, a consultant, a small business, etc.posts content and consumers read it. With Web 2.0, ‘consumers’ become ‘prosumers’ (producer/consumer) and both produce and use content. Wikipedia, Youtube, Facebook, Ebay, each provides the platform, and prosumers work together to provide the content. Social media is web 2.0, however what you find on social media are people, their social network, and the individual content created and shared (liked, pinned, tweeted, etc.) by the people. The importance of content depends on how many people like it. [EDITOR’S NOTE: Recall in my interview with Web Developer John Foland that Google’s algorithm is like a voting system, and every link is considered a vote. But not all votes are equal: higher PageRank-ed websites have more heavily weighted votes. So if website A is important and has hundreds of backlinks and links to B, and website C also links to B, but C is but a small site, then if B links back to A, that diminishes A’s vote to B by a little bit. And if B reciprically links back to A that diminshes the vote a lot more. 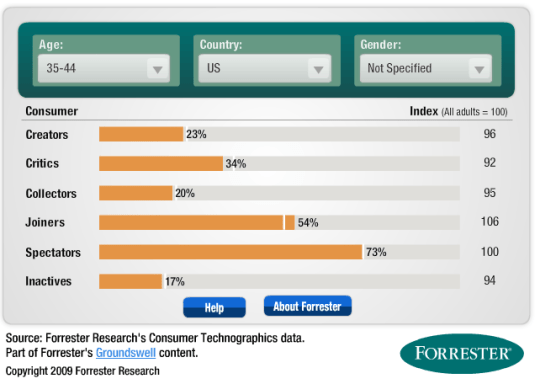 00:16:53 Forrester’s Seven Overlapping levels of Social Technology Participation shows in real-time how a particular consumer demographic behaves. This knowledge is important because markets change. When you’re happy or unhappy about a particular product or brand or event, you want to let everybody know. Many Human Resources Marketing resources were written prior to Web 2.0. 00:33:43 An error on a retail website was selling Apple mac book online for only 49.99€. A man with a large Twitter following bought a couple and then tweeted the deal to his followers. This sale went viral and within minutes 1,000s of Mac books were sold. In the end the company didn’t honor the sales, but gave vouchers and held a lottery so some of the buyers did get a Mac book at that price. The customers understood the mistake and appreciated how the retail website handled it.A potential social media public relations nightmare turned into a success. There isn’t anything in Human Resources which cannot be supported via social media. [EDITOR’S NOTE: Recall in Armin Trost’s lecture How to Keep Quality Employees (Part 2) that one of the most important things for Millennials are their peers. One of the best things companies can do to retain their employees is to let them become friends. The boss is also a very important facter with regards to whether an employee stays with your company. 00:41:13 When employees have work-related questions, they will more likely find solutions online or with their colleagues than immediately with their boss. [EDITOR’S NOTE: Recall in Armin Trost’s lecture Identifying & Developing Key Employees that ideally, a company would promote the person who demonstrates extraordinary growth and ability by learning and improving his or her skills the quickest, assuming that this growth and talent will continue into the future. Also, recall also in Keith Rabois’ lecture Operating Your Business For Growth & Success that there are two basic types of employees: ammunition and barrels. Ammunition – these employees are good at doing things and getting the job done. These employees are important to the success of your business. Barrels – these employees are good at focusing and shooting the ammunition. These employees are crucial to the success of your business because they can take an idea from inception to production and because no matter how much ammunition you have, you need the barrel for the ammunition to be useful. Barrels are VERY hard to find, and when you find one of these kinds of employees, make them a priority. Find barrels and then stock them with ammunition. Watch how they handle simple, stupid, mundane tasks such as having cold, fresh smoothies delivered to a group of hard-working engineers at 9:00 PM every night. Expanding the scope of responsiblity of your employees until they break shows you how much responsibility each person is comfortable with and ensures that that person is being used to their full potential. 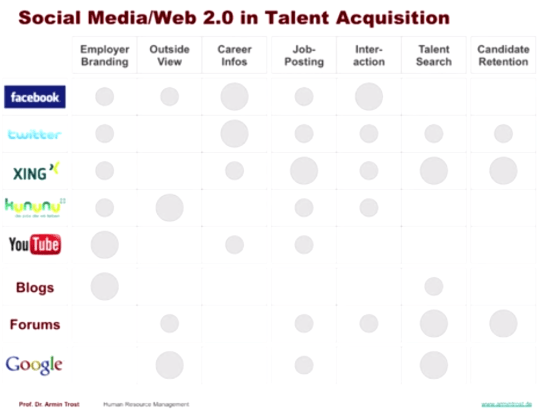 00:43:04 The above slide is just an example of the different ways Human Resources can use social media for talent acquisition: attracting & selecting the best candidates. 00:47:26 Don’t just launch a Facebook fan page. Look at the company strategy and the define the target demographic the company wants to reach. As soon as you have a fan page, you also have to have a crisis strategy. Because as you’re opening a page, you’re letting the possibility for everybody and anybody to talk with you, but also to critique or insult you. You need to find a way to be reactive and manage these kinds of situations. Opening a facebook page and simply posting things isn’t a safe solution. Some brands think in terms of channels and not content. You ‘need’ a facebook page but don’t know what to do with it. You ‘need’ a website but don’t know where you want to go with it. There was a time when everybody ‘had to’ be on facebook – no matter what – as it is a popular social network. Steven Brinlee, Senior Creative Director of AR NY points out that brands can get so “caught up in this forward momentum, it can become a sort of ‘me too’ default reaction for brands, causing them to be easily enticed into jumping headlong into the pool before taking the time to define what they actually want to be in that digital space.” But it’s important to remember that without a goal and a clearly defined brand objective there’s no reason for you to be on facebook, or any social network for that matter. 00:48:22 Some companies are so out of date that they’ll need to be explained what all the different social media sites do and who they are for. In most companies the DRH is in his or her 40s-50s, and so wouldn’t be ideal for choosing the content for a Facebook page created to attract university student graduates. A good blog is a blog which is read by many people. 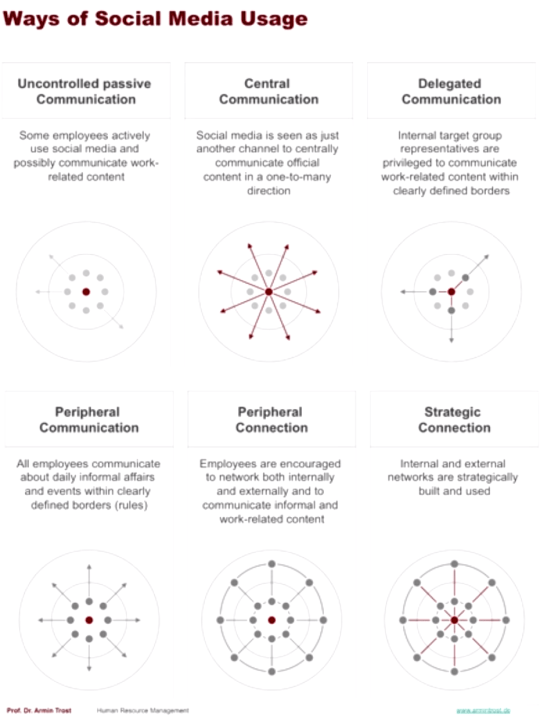 01:05:11 Companies use social media in so many different ways that it’s difficult to classify, but can be boiled down to six basic types. Posted on October 15, 2015 January 17, 2017 by Joshua SMITHPosted in videosTagged Armin Trost, hochschule, human resources, men, social media, videos, youtube. Previous Previous post: 148. How To Start A Startup: 16 Interview Questions to Close A Venture Capitalist.